Barefoot Angie Bee: Barefoot Shoes vs. Minimal Shoes debate. I say bareshoes. Barefoot Shoes vs. Minimal Shoes debate. I say bareshoes. 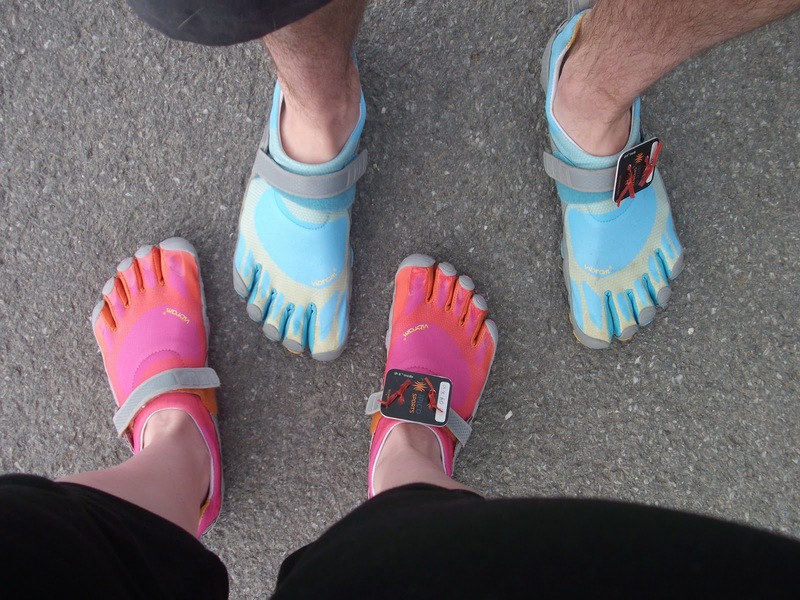 Jason Robillard from Barefoot Running University just put up this blog post about his succumbing to the idea of using the term barefoot shoes. It is a heated debate among barefoot runners. As he pointed out, barefoot runners, and at one time I too felt this way, feel like their accomplishments were cheapened when they actually took the time and care to learn how to run barefoot, as in sans shoes, only to have people think they were wearing a pair of those "silly toe shoes". I am now at a point to be quite comfortable in my own proverbial shoes and am able to not care what others think. I like to run barefoot. I sometimes use shoes. I like shoes but still prefer to run barefoot. The marketing people have pushed barefoot shoes as a name, term, and definition of minimal shoes. Granted its a marketing technique to get people to buy a product but it also sold an idea. An idea that the "people" seem to love. The marketing folks know what they are doing evidently and it really is clever on their part. I for one am glad of it. I want people to learn good running form and if being interested in barefoot shoes will do that then rock on I say. Besides, I don't think that the barefoot running movement would be any more than some weirdos that run barefoot screaming that their way is best (which it is but who wants to listen to the screaming weirdo) instead of an actual movement if the shoe companies didn't see a niche and jump on it with their marketing campaigns. Yes, the term is an oxymoron but that duality also grabs attention, which makes people think, which piques their interest and makes them ask questions, and that really is the point. I think that the term bareshoes should replace minimal shoes for a few reasons. At the top of my list is that when you think of barefoot running you think of the time it will take to get used to it. People are struck with a contradiction. They remember being barefoot as a kid and yet as an adult it is not always pleasant having tender feet. Its simultaneously appealing and repelling and as I mentioned before about the oxymoron of the term barefoot shoes grabbing your attention, the duality of the love/hate of barefoot also grabs attention. Most people will not run barefoot full time but they are barecurious and want to know more about it. The term minimal shoes seems outside of the "barefoot" idea. They are still shoes even though they should not be treated as just shoes. There is not really any time taken to get used to a pair of shoes. If the shoes are labeled as barefoot shoes then people will associate those shoes with the idea that they too should be worked into slowly just like one would with actual barefoot running. Shoes give a false sense of security and doubly so with minimal shoes. Yes minimal shoes will strengthen your body to move the way it was meant to yada yada yada but when you put them on and they feel so good and your feet don't tell you to take it easy like barefoot running will do, to me that makes them even more worthy of caution than actual barefoot running with its intense feedback mechanism of which shoes dampen. 'Natural running' is a great term to refer to running form, of which can be applied to just about any shoe or lack of that you choose, but it doesn't address the fact that there is still a difference between barefoot and barefoot shoes. I teach good form which is learned through barefoot running however that form can be transferred to running in shoes as well. To streamline teaching I think having the word 'bare' link them together works well and I think marketing people who study this kind of thing would agree. The point is to educate and which term reaches the widest audience? The term that implies barefoot. Nobody is trying to take away from the accomplishments of the barefoot runners. It may seem that way to some but really when you are out there running with free feet on the ground and a smile on your face and that connection you feel to the world, its not going to change your experience if someone thinks they did the same thing in a pair of bareshoes. I don't run to get kudos from others. Its nice but not why I do it. It does mean that the person thinking you ran in 'those pocket toe shoes' is missing out but it also opens up dialogue about form which is the underlying key to happy running. It takes away from the exchange of information if we bicker about the semantics of the terms used. Use what terms you like but I however for a streamline affect as well as being able to reach a wider audience am a Natural Running Coach who reviews bareshoes and prefers to run barefoot for 99% of my time. It occurred to me that the debate is mostly confined to the barefoot runners who already 'get' the love of being barefoot. They want the world to know of the joy they have found. So what we need to do is look at it from a perspective of a newbie and what options are available now. When I started out there were VFF of which I didn't have the money for and there wasn't anyone teaching good form and there were water shoes so I went barefoot because my situation dictated it. Now there are options so the world has changed in the last two years and I plan to continue to change as well and adapt to my environment in order to further teach good form. I run barefoot, but not enough to be considered a barefoot runner. Yet I, unlike Jason, will NEVER refer to them as "barefoot" shoes. But, to each their own. To me, a minimalist runner is still wearing shoes. The phrase "shoeless runner" makes sense to me; it covers VFF, socks (which I'm starting to see on our cold winter roads), flip flops - anything which isn't a more traditional running shoe. Bareshoes doesn't conjure an image for me. I'm sure there is a phrase out there that does; it's bound to hit soon. I'm not sure I would be able to switch from calling them minimal shoes to barefoot shoes. I've always called them minimal. Its just part of my vocabulary and I admit the term barefoot shoes feels a little wrong to me. That being said I do like the term bareshoes. I think it would be a more effective marketing sell as well but I know some companies are already heavily invested in the term barefoot shoes. I just think its cool that the term has such debate and that we are witnessing the beginning sparks of a whole new genre of running shoe. I agree the term bareshoes is a better description. However whatever term is used, the actual words that make up that phrase are a little irrelevant as the phrase itself has meaning beyond it's constituent parts. I remember when the UK has a bit of a problem with joyriding. One of the newspapers said that they wouldn't use that word again, as there was no joy in teenagers stealing a car and taking it for drive, which usually ended up with a crash and a death or two. What they failed to realise is that term had already become a new word in itself and didn't convey any joy - only stupid people thought that. I'm in the middle of creating a website all about "bareshoes". Not just for running, but for life. I found having gotten into barefoot running that my body's adaptation was helped by wearing "barefoot shoes" whilst not running. I.e. it kept my calves and achilles stretched out, which only helped with the new form of running. I actually wanted a domain with "barefootshoes" in it, but when I found they were all gone, I settled on bareshoes. I've since come to like this term as for me it describes the bare-ist possible shoes, which is what barefoot shoes are all about. I don't think the term for barefoot shoes, or minimalist shoes will change to bareshoes, but I like the idea and it defiantly works for me.